Our rates are set to reflect a good value for the service. 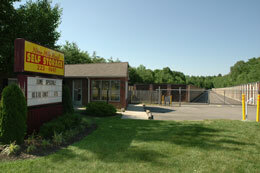 At Nine Mile Road Self Storage we make renting easy & affordable. Call (804) 222-8145 or contact our Storage Specialists to determine the correct storage unit size for you, so you aren't renting more than you need. With your own computerized access code you can get into our storage facility and your storage unit at your convenience during our extended gate hours and most holidays. Our Nine Mile Road location is conveniently located in the East End of Richmond and is easy to find. Not only can we accommodate all your personal storage needs, we can also accommodate your business storage needs. If you run a company that needs extra storage space for inventory or archives we are the affordable solution for you. You can even arrange deliveries directly to your unit. We have Easy Payment Options with No Long-Term Contract. We accept all major credit cards and can even set up autopayment or monthly billing for your rental. We offer a full range of storage units from 5' x 5' (25 sq. ft.) all the way up to 10' x 25' (250 sq. ft.). Each are easily accessible drive-up units for at-the-door loading and unloading. We offer a full range of packing and moving supplies and will pre-package a phone order & have it ready to pick up on your arrival.